Microstep: Set aside just a few minutes each night to write in a journal. I would like to make writing a part of my daily practice again. I used to journal each morning and since my commute has changed so much over the past year, finding this time in the morning has grown increasingly difficult. I hope that by choosing this microstep and incorporating it into my evenings, I can build this back into my routine in a way that makes more sense for me right now. I hope to be comfortable with an evening writing ritual, even if it is only for a few minutes, and to be content with whatever may come from that dedicated time. I was pretty consistent with my microstep — missing only about five days total. For the first few weeks, I wrote in my journal every night, even if it was just a few words about how my day went or things I was feeling. Towards the end of the Microstep period, I caught a pretty bad cold so I was not sleeping very well. I found it hard to keep with my Microstep during this week, as my sleeping schedule was off and I couldn’t seem to find a good time to keep on schedule. That said, I would find other times during the day where I could fit in time to write — whether it be in the morning before I left for work or on my commute. I faced a few challenges implementing my Microstep. First, I found the the overall timing to be a bit difficult. A few nights I was so tired and was falling asleep before I remembered to write. Yet, after a few weeks, it became easier to incorporate this into my daily routine. Overall, I felt better when I wrote because it felt as if I was releasing all my thoughts and worries on paper rather than letting them linger in my mind. I also felt quite guilty when I didn’t write, but the guilt did prompt me to keep going! Sleep — I find I sleep more soundly after I journal. There is something quite calming and relaxing about reflecting on my day and writing down all the lingering thoughts and concerns on paper. Some nights, it felt as if a weight was being lifted off my shoulders onto the page. As I closed my notebook, I gave myself permission to release that which I could not control. Creativity — I love reading and writing poetry, yet I haven’t done either in quite some time due to my recent schedule. On November 27th, 13 days after I began my challenge, I wrote the first poem I had written in probably six months. I felt that this was a concrete result of me sitting there with a pen in my hand and a notebook in my lap. It was as if muscle memory sparked the creativity, and resulted in a benefit I did not expect. Communication — There was a situation that come up in which I was having trouble communicating with my boyfriend. By stream of consciousness, I wrote down everything I wanted to talk through and then restructured my thoughts into a list for clarity. This allowed me to feel more confident and prepared for my next conversation with him and actually helped us to both connect and understand each other in a way that we were not quite able to do beforehand. My main learnings are that you can definitely create a habit in 32 days and that habit can have unanticipated multiplier effects. In terms of building a habit, I already felt the pull to journal at night about halfway through the 32-day period. I think it was helpful that I set a daily repeating reminder on my calendar which would alert me to write at 8 p.m. Even if I could not write at that second, the reminder brought my Microstep top of mind. The multiplier effects of my Microstep are positive in that journaling allowed me to sleep better, be more creative, and communicate more effectively. If I could have done something differently, it would have been to be more flexible with my microstep during the week I was not feeling well, so I could write in the morning or afternoon if possible. 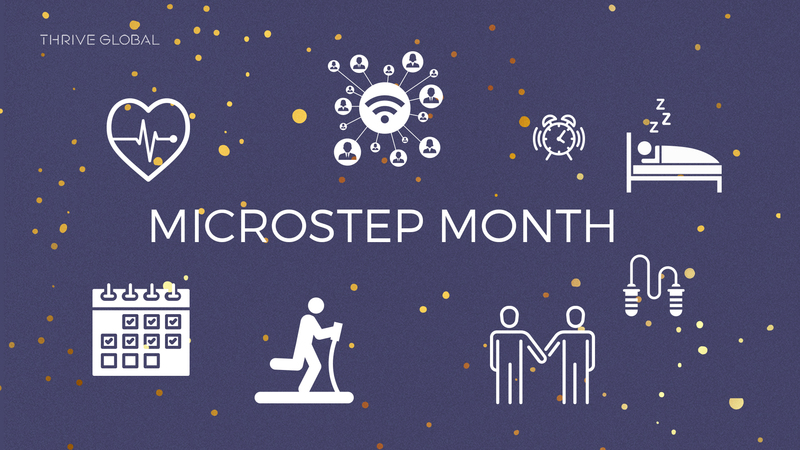 My advice to someone else embarking on a 32-day Microstep challenge is to not let little setbacks get in the way of achieving your ultimate goal (to make this Microstep part of your daily life). If you fall off the horse, get back on as soon as you can. For me, this means journaling the next morning if I miss an evening, not necessarily waiting until the next evening to do so. This prevents the the accumulation of missed days, which essentially makes it harder to begin again. Kasia Laskowski is an Executive Assistant at Thrive Global. She brings with her eight years of experience in the nonprofit and humanitarian sectors where she witnessed firsthand the epidemic of burnout in countless organizations staffed with passionate and determined individuals. Most recently, Kasia worked as Communications Director for the Religious of the Sacred Heart of Mary, an international congregation of Catholic women. Prior to that, Kasia worked in the fields of international humanitarian training and academia. Kasia studied International Political Economy at Fordham University and is soon to complete her MA in Humanitarian Action from Fordham’s Graduate School of Arts and Sciences. In her spare time, Kasia enjoys learning about spiritual pathways to healing and applying them to her life.